Below is our letter of intent for the 2018 BRC Honoraria. Cyberbot Wars: Shall We Play a Game? 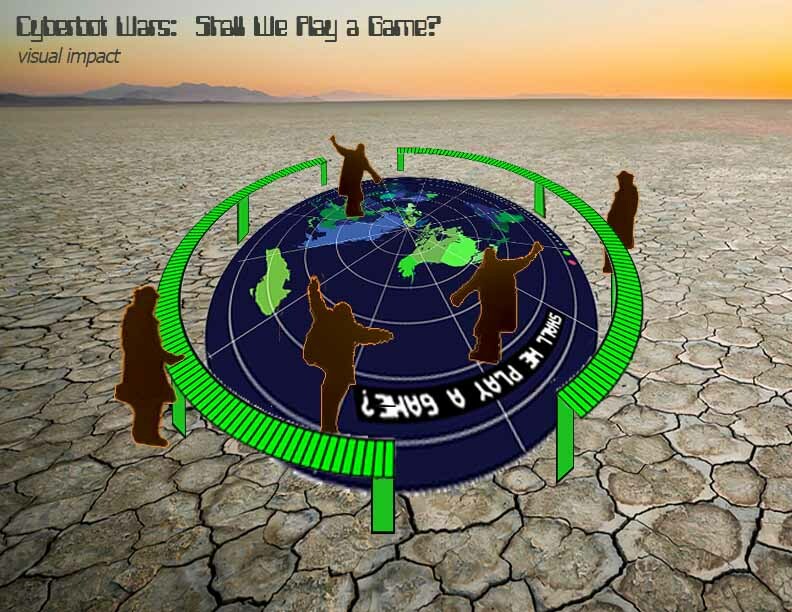 A game-like experience illustrates how information bots are used to influence world events. In passive mode, an LED animation on a giant map shows the friendly globalization of the burner community over time. In game mode, it is war, and people protect or attack countries with cyberbots. The proposed global map will be round in shape with a 20 foot diameter, built as a stage upon which people can walk with LED lighting from underneath. The top layer will be ½ inch clear acrylic, the second layer ¾ inch plywood with country-shaped cutouts filled with sign-white acrylic. Controllable LEDs strips will be used to outline each country shape. (We have successfully used this method in the past to create a 30-foot pinball playfield stage.) The LEDs will be controlled by an Arduino interfacing with a laptop. 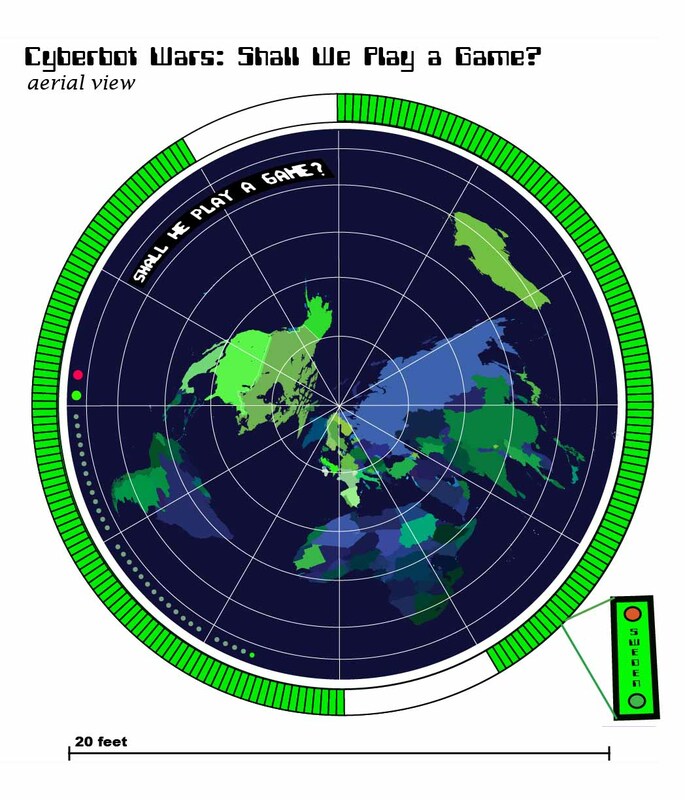 For the interactive game-like experience, the map will be ringed by a raised, narrow command and control platform, with 195 country name labels, each with 2 buttons, a green and red button with the probot and antibot icons. As people approach the map, from a distance they will see it animating with the visualization representing the changing demographics of burners over time. They may get on the map, and dance around. They will see a blinking sign that says “Shall we play a game?” Someone will press a button, and the visualization will go into game mode. In game mode, people protect or attack countries using “probots” or “antibots”, and the map visualizes the spread of sentiment over time. When they press a country’s red, antibot button, they will see that country light up briefly in bright red, and the red will spread to nearby linked countries before fading slightly. The same is true of the green button. The animation will be designed to evoke the viral spread of good and bad cyberbot memes to the most linked neighbors. We expect over the week countries will be a brighter green based on the demographics of burners, essentially creating a giant, networked sentiment map. With this project, we seek to highlight on the one hand the increasingly global nature of the Burning Man community, with the sense of wonder and optimism that emerges from relationships around the world founded on the Burning Man experience, and on the other hand, the emerging global threat represented by the information wars, played out in part by cyberbots in the social media landscape. Our aesthetic is inspired by the classic 1983 “War Games” movie, where the cyber confusion between reality and game playing almost starts World War III. On the bright side, Burning Man has gone global. Once largely West Coast, the burner population now encompasses not only the entire United States, but also Europe and beyond. Even our own Seattle-based camp feels like a United Nations of makers. As we create together and party together, our members negotiate their cultural similarities and differences, forging deep bonds in the heat of the desert that translate into friendships across the world. On the dark side, we are experiencing a crisis of misinformation on the global scale through the ubiquity of social media and its vulnerability to corruption by agencies with ill intent. In the United States and around the world, we have been hacked, and divisive trolls and Bots in social media have exacerbated conflicts between social groups, creating a heightened state of culture wars. It is a critical time to proactively reclaim our global narrative, and consider how we can fight back. Where do you see your art project being experienced? At the annual Burning Man event, in other locations, or both?